AREA TEAMS INCLUDED: Highlands, Sam Houston. 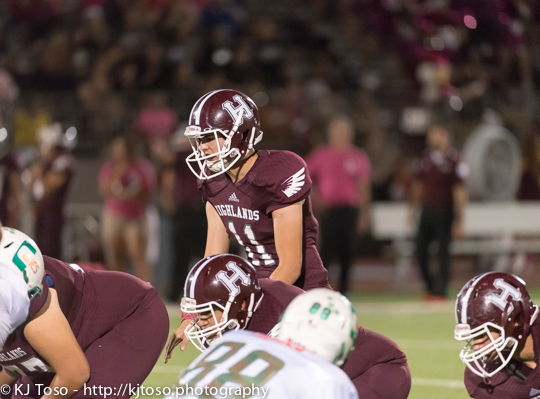 Highlands junior quarterback Dylan Camacho (11) surveys the defense. Sam Houston receiver Jawon Anderson (14) tries to escape heavy pursuit from Highlands senior Joseph Mangaccat (26) and Rene Lopez (56). Anderson logged 116 reception yards and 2 touchdowns. The Owls’ defense swarms to the ball. 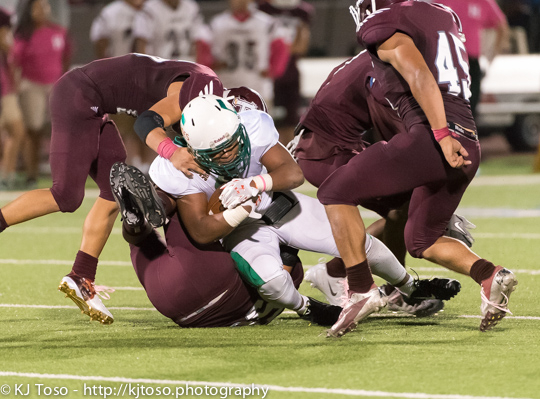 Defensive end Kyle Ellis (45) closes in to wrap up the Hurricanes back. Seven games into the 2015 season, Sam Houston has yet to face an opponent who can slow its furious offensive pace, but showed a bit more of what their attack entails Oct. 8. The Hurricanes (7-0, 5-0) displayed a more potent rushing attack than they have at times this year in the first-place showdown with Highlands (4-2, 3-1) at Alamo Stadium. Senior back Devin Harris ran for 129 yards to lend balance to Sam Houston’s quick-strike output in a 34-6 decision that kept it atop District 28-5A. Sam Houston ran for 163 yards and passed for 161 for an offensive total of 324 yards. 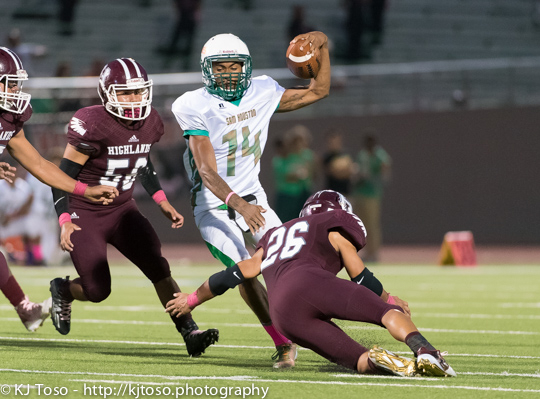 Highlands mustered 189 yards in 48 attempts (20 more than Sam Houston), but only gained 16 yards through the air. The Owls also committed three turnovers to the Hurricanes’ one. Sam Houston senior linebacker Robert Bledsoe produced an interception and a fumble recovery. After a scoreless first quarter, senior quarterback Raymonte Prime – who accounted for all of Sam Houston’s passing yardage – threw 32 yards to junior Jawon Anderson (116 yards, 3 receptions) to give the Hurricanes a 7-0 lead. Sam Houston drove 81 yards in six plays to take a 7-0 lead with 6:50 until halftime. Highlands had matched the Hurricanes defensive stop for defensive stop to that point. The turning point seemed to be a 55-yard blocked punt return by Sam Houston’s Freddie Scott just 2:15 before the half. The two-touchdown lead never was in jeopardy. Prime found senior transfer Jair Jordan (6-foot-3, 220 pounds) early in the third quarter for a 21-0 advantage. It was first reception of the season for Jordan, who has helped strengthen Sam Houston’s defense. An interception from Owls senior Chris Hernandez led to Highlands’ only score. As time ran out in the third quarter, Bruce Moody (63 yards, 18 carries) bolted six yards to the end zone. Josh Harris (52 yards, 6 carries), Devin’s cousin, followed a block from Prime for a 16-yard touchdown with 10:25 left. Prime threw 28 yards to Anderson for the game’s last touchdown at the 6:20 mark. 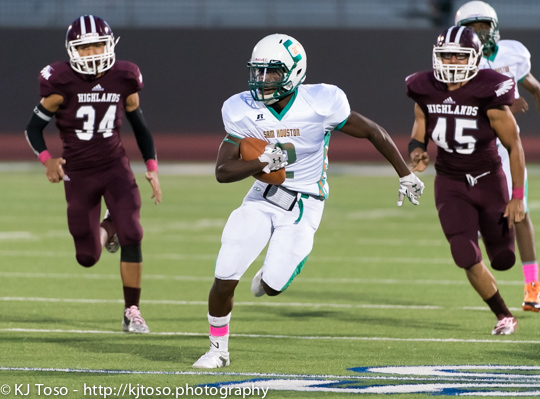 For Highlands, Juan Guerrero ran for 44 yards on three carries and Matthew Castillo gained 41 on 13 attempts. 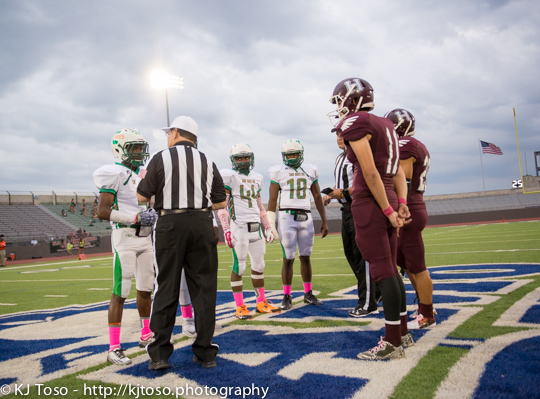 The Owls will play Burbank Friday, Oct. 16 (7:30 p.m.) at the SAISD Complex. Sam Houston faces Edison Oct. 16 at Alamo Stadium. Kickoff is 7:30 p.m.